Not all conductors are equal. Copperweld® brand products are designed to be the best at handling the worst of punishment. Copperweld manufactures the only welded copper wires and accessories with a flexible, solid steel core made in the USA. That means our wires stand strong against the elements, decades of wear, and even copper thieves, too. 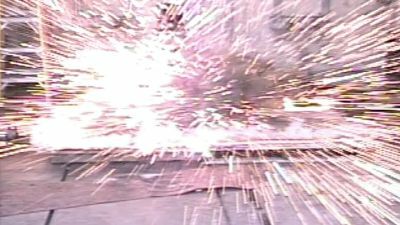 Welding and Cladding are NOT the same. What’s the difference? We combine our proprietary high-heat, high-pressure process with the world's highest-quality steel and 99.999% oxygen-free copper — offering superior ground protection and unmatched durability. Copperweld is the best choice for demanding applications. With an oxygen-free inter-diffusion layer, Copperweld wires stay stronger longer than any other conductor — making them the perfect choice for applications that involve stretching, swaying, bending, beating, heat and humidity. Whether you're protecting your power network, construction project, vehicle components, or your pocket, Copperweld's long life means big savings over time. Our conductors maintain spec-compliance long after most competitors' are replaced. Solid copper wires waste valuable copper within their core and use substandard ETP copper which introduces nano-bubbles of electrolytic oxygen. Copperweld uses the world's highest-quality OF copper fortified by a flexible, high-grade, solid steel core. That means our wires stand strong against the elements, decades of wear, and even copper thieves, too. Is copper theft an issue in your area? Copperweld’s solid steel core and unextractable, unscrappable copper skin have zero street value — making it unattractive to copper thieves. 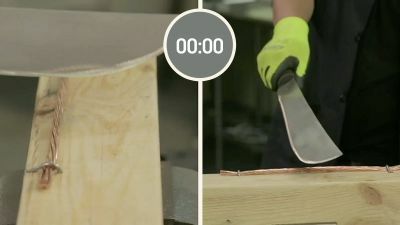 Copperweld steel-core wire is annealed to bend like copper while maintaining the strength to survive real world application threats like hammer blows, axe strikes, or door pinches. Copperweld is lighter than copper, interfaces with all copper connectors, is strong enough to pull through tight spaces, and has the tensile strength (even at tiny diameters) for coupler crimping. Copperweld may have written the book on copper-welded steel, but that doesn't mean that we've closed the book on improvement. The same culture of excellence and innovation that originally inspired our first products over 100 years ago still drives us today. We're always looking for better ways to test, manufacture, optimize, customize and support the products we deliver. We're committed to getting better every day. 'Better' is not the accident of chance; it's the outcome of purpose. That's why we're always revisiting performance tests, improving manufacturing processes, expanding our product offering and diversifying market reach. With over 100 years of experience supporting and specifying mission critical applications, the Copperweld sales, support and leadership teams are among the most knowledgeable subject matter experts in their fields. Made in the USA, Copperweld offers more than the quality and dependability that often comes with domestic manufacturing. Our strategic location allows us to offer bundled custom orders and provide lead times as short as 2 days shipped. Ever been curious about the theft-deterrent performance of common 2/0 stranded copper versus the equivalent copper-covered steel wire? This test features the weapon of choice for most copper thieves: a machette. How many licks will it take to get through the center? Why use copper-covered steel? It’s not just about theft deterrence. Copperweld is specifically engineered for superior ground fault protection. 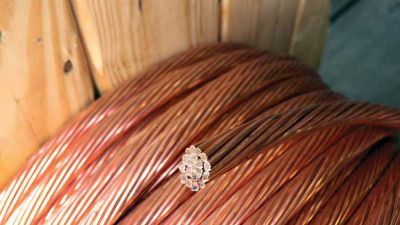 Copperweld brand ground wire provides a more cost-effective solution for conducting real-world faults, which are asymmetrical, shorter duration threats. In "Measuring the Performance of Copper-weld vs. Copper in Transmission and Substation Grounding Applications," Jeff Jordan, Copperweld Power Grid Segment Manager, demystifies common misconceptions about the modern power grid's grounding needs. If you're excited to see more than the teaser we've pre-released here, share your email and we'll send you a message the minute it goes live.